Born in Atlanta Georgia in 1946, Robert was raised in Albany, Georgia by two loving parents and is married to his college sweetheart, the former Jane Gardner of Montgomery, Alabama, his faithful wife of 42 years. He has two children, i.e. a daughter, Leigh Ann, and a son, Richman, and four loving grandchildren. 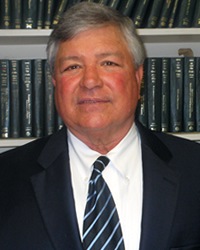 He graduated from Auburn University in 1972 with a BS degree in Business Administration and graduated from Mercer Law School in Macon, Georgia with a J.D. degree in 1972 and was admitted to the Georgia bar in November 1972 and has been practicing law in his home town of Albany, Georgia for the past 40 years. As a boy and young man, his parents made sure that he went to church faithfully at one of the prominent protestant churches in town. He made what he thought was a profession of faith when he was twelve years old and probably another 20 or 30 more times after that through the years. On or about 1993, after becoming disillusioned and frustrated with trying to balance grace on one hand with the virtual impossibility of keeping the law and abide by the basic church covenants on the other, he was blessed to have heard the message of the gospel of salvation based on Christ’s finished work alone based on the imputed righteousness of Christ from Pastor Bill Parker while visiting Eager Avenue Grace Church. After several months of listening to the messages taught by brother Parker which was starkly different than the Gospel he had listened to for over 35 years, he came to know and understand some of the basic concepts of the scriptures such as how God can be just and justify an ungodly sinner based on the imputed righteousness of Christ, the doctrines of Substitution, Imputation and Satisfaction, and especially his biggest bugaboo on the work of Christ, i.e. For whom did Christ die? He finally saw the merit in the fact of Christ’s dying for his sheep alone, and was graciously given eyes to see and ears to hear at which time he embraced the simple message of the finished work of Christ. He is fortunate in that his wife and two children both subscribe to and believe the gospel of grace alone. He has been a member of Eager Avenue Grace Church for the past approximately 20 years, and is in the process of writing a book on salvation entitled “A Matter of Law and Justice”.